The Travel App That Turns Your Smartphone Into a GPS Audio Tour Guide for Your Vacation Road Trips Just Ahead is the perfect road trip app. With its guided tours and offline maps, you feel like you have a friendly tour guide along—and you don’t need an Internet connection or mobile phone signal to enjoy the narrated audio tour. ••• ‘BEST TRAVEL APP’—North America Travel Journalists Assoc. 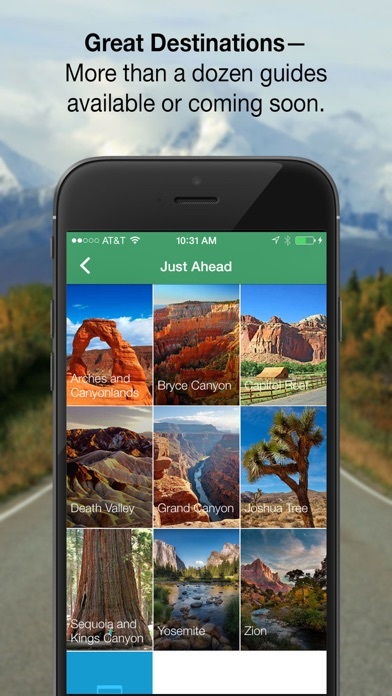 ••• ••• ‘BEST APP’—Sunset Magazine ••• ••• TOP FIVE NEW TRAVEL APPS—USA TODAY ••• • ROAD TRIPS BROUGHT TO LIFE! • Just Ahead’s travel guides tell you what you’re seeing as you drive through America’s most compelling destinations. 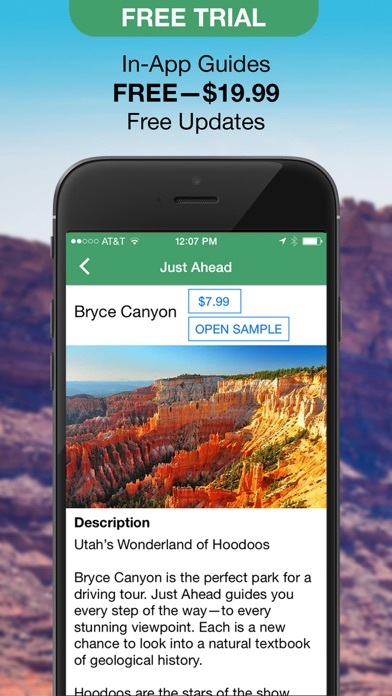 GPS prompts the app to deliver spoken descriptions and stories of the scenery and sights just outside your car window. No more thumbing through guidebooks or fumbling for maps. You see a sight and wonder, “What’s that?” Just then, Just Ahead tells you what you’re seeing! ••• WHY IT’S THE BEST TRAVEL APP ••• • Works Offline • Audio guides and built-in maps don’t need an Internet connection or a mobile phone signal. • More Points of Interest • Just Ahead tour guides contain more points of interest and stories than any other audio travel guides. • Inside Information • Each guide is written by an expert author and spoken by a professional narrator. You simply drive, while Just Ahead informs and entertains you. • Great Stories • The scenery comes alive: notes on wildlife, geology, flora, history, people. • Easy to Use • Just Ahead audio tour guides play automatically. Just turn on the app and begin driving—it talks whenever there’s something informative or entertaining to say! • Helpful Suggested Directions • Just Ahead guides you to and from your destination. It tells you why you should turn or not, what you should do after a turn, and recommends the best direction to take. • Family Friendly • Just Ahead audio guides create shared experiences, conversations, and memories that will last a lifetime. • FREE TRIAL! • Audio tour guides are available as in-app purchases and range from FREE–$19.99. Each guide includes a full-function free trial and free updates. ••• AVAILABLE GUIDES ••• Yosemite National Park, California Grand Canyon National Park, Arizona Yellowstone National Park, Wyoming and Montana Grand Teton National Park, Wyoming Zion National Park and Cedar Breaks National Monument, Utah Bryce Canyon National Park, Utah Death Valley National Park, California Sequoia and Kings Canyon National Parks, California Joshua Tree National Park, California Capitol Reef National Park, Utah Arches and Canyonlands National Park, Utah Petrified Forest National Park, Arizona Black Hills and Mount Rushmore, South Dakota Badlands National Park, South Dakota Big Bend National Park, Texas Note: Continued use of GPS running in the background can dramatically decrease battery life. Why are you even bothering to read these reviews?! Download the app and get started exploring and/or just enjoying a drive. There aren’t enough superlatives or words to describe how much this app increases your enjoyment and sense of adventure on a road trip. If you aren’t adventurous you will enjoy hearing and learning about the places you pass. History, Fun facts, etc. 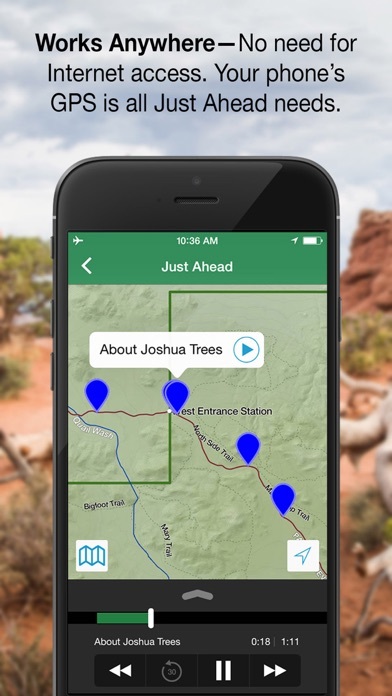 If you are adventurous - the app invites you to stop, hike, drive, explore stops along the way - and gives you great instructions about how to access the stop. Again, I ask - why are you hesitating?!?!? Download the app and get started. Used Gypsy Guide in Canyonlands and Arches and was looking for something similar for Capitol Reef and Zion. This was no good at all by comparison. No insight, no local stories and lots of direction to gift shops and what to buy. Really disappointed. Gypsy Guide is so much better. Best audio guide ever ! We discover this app in big bend national park, Texas. It’s an absolutely must have if you want to discover completely those beautiful parks in USA. It work with geolocalisation, you drive and it trigger automatically when needed. The annual pass is a great deal. Again, it’s a must have ! Best Audio Guides to National Parks! 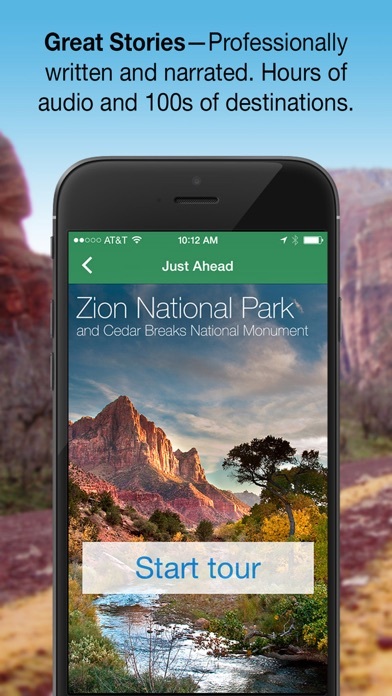 Just Ahead is a fantastic audio guide to your travels through the National Parks! My whole family enjoy the little details and fun facts that you learn about that specific area as you are driving through the park. We only wish Just Ahead had a wider selection of guides to more parks! It’s like having a personal tour guide in your car! We went to the Smokies and loved this app. The guide is timed to give great information before a stop, so you know what you are about to see. 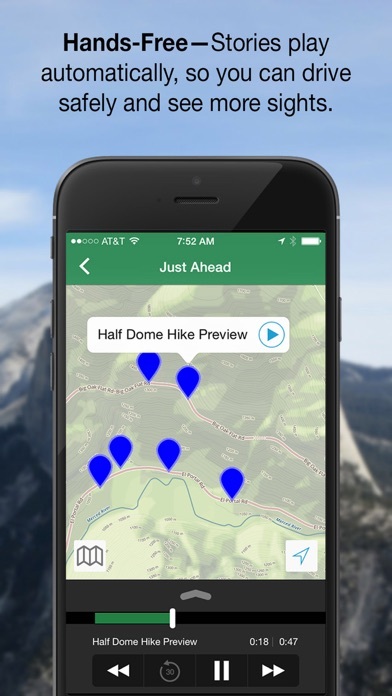 We are visiting national parks in the west this May so buying this app was a no brainer. I rarely review apps but this one deserves my time. We used this the first time in Big Bend, TX during the government shutdown. It was like having a personal tour guide who pointed out several things we would have otherwise overlooked. Additionally it provides a lot of historical information. Because we are traveling for the year, we purchased the unlimited guides. Well worth the money! Let me begin by saying the content is great! Thoroughly enjoyed it. The app itself is low quality and buggy! A couple major things: 1. The design is with low quality images. Everything looks like 1990s design. Hard to imagine the image quality is low even on a small phone screen. 2. The title of the places of interest are cut off! So here we are in a new national park, trying to guess if we are going to Skull Rock or Cactus Garden based on the description. Once you click on a point on the map the top is sliced off. Very annoying and bad for planning. 3. The auto play feature worked for the first time then stopped working altogether. It won’t speak to us when the phone screen is locked and we missed a couple destinations because of it. I had to set my phone to never lock to keep the app working. It worked at the end with the hack but was nonetheless extremely annoying and a battery killer! Must download if your touring big bend. I would spend $10 for the app at least. Use it the whole time your driving. I am sure it’s amazing for other National parks. Download and give it a try. We traveled to Great Smokey Mountains on numerous occasions and thought we knew a lot till we tried the app. Great job on history and details of park. Works great can’t wait to try other parks. Definitely a 5 star app easy to load and super easy to use!